With the introduction of iOS 7, Apple added a ton of new and exciting features to your iPhone. However, in order to show off all of these new features, Apple has decided to turn them on: all of them. There’s an opt-out method (of sorts) when it comes to their use, but depending on the age of the device, this can decrease both performance and battery life. The problem most users are encountering is that they don’t know how to selectively opt-out of the features they do not use. The following will outline how you can fine tune your iOS 7 experience, taking advantage of the features you like and turning off the features you don’t. In the end, you may find that you won’t need to charge your iPhone quite as often. Dim the brightness setting: If you think that iOS 7’s new display is a whole lot brighter than that of iOS 6, you may what to check your brightness setting. The brightness setting may have changed with a recent update. 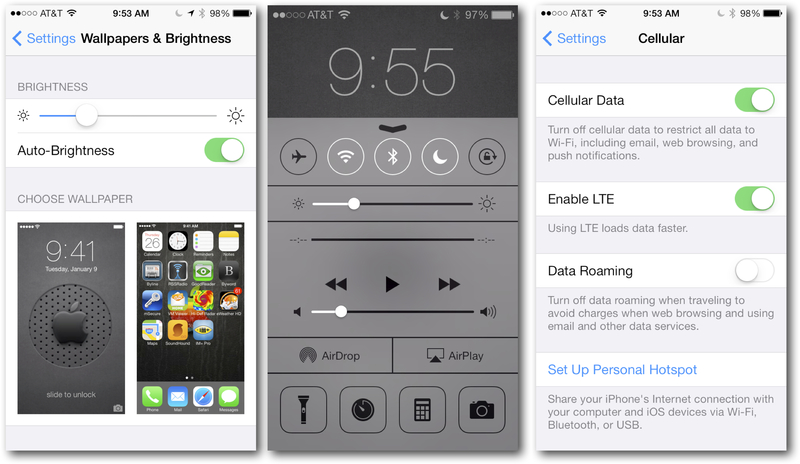 You can access your brightness setting by swiping up from anywhere with Control Center. More so than any other setting, modifying the brightness of the screen will have the biggest impact to battery life. Conserving cellular usage: Using airplane mode can be a real power saver when you are in indoors or in bad coverage areas. This can prevent the iPhone from searching for a signal and trying to stay connected. Another good idea is to use Wi-Fi in areas that offer such access to the internet. Accessing the internet using a Wi-Fi network uses less of the battery than accessing the internet over a cellular network. You can even turn on Wi-Fi when using airplane mode. Within the Cellular section of the Settings app you can also select exactly which apps can access the internet using cellular data. If you are interested in preserving as much battery life as possible, say for an important phone call, you may also want to disable both LTE and Cellular data all together. Some hidden cellular data features: There are also three somewhat hidden cellular data switches in iOS 7. The first one is in Safari. It will sync items in your reading list from all of your devices connected via iCloud. The second is located in iTunes & App Store settings; it enables music downloads, iTunes Match and iTunes Radio usage over cellular networks. 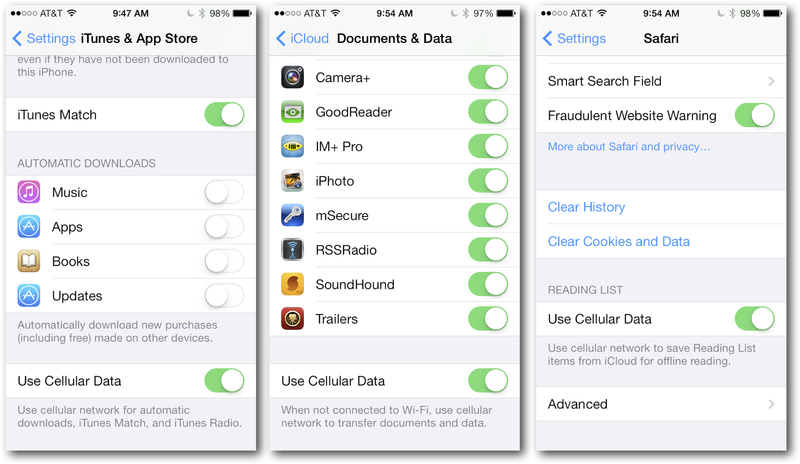 The third hidden cellular data setting is in iCloud’s Documents and Data section. It enables syncing of data for apps that use iCloud storage. Here you can also individually pick which apps can sync data with iCloud. Provided you don’t feel that each of these settings will affect how you use your iPhone, you may save some power by shutting them off. 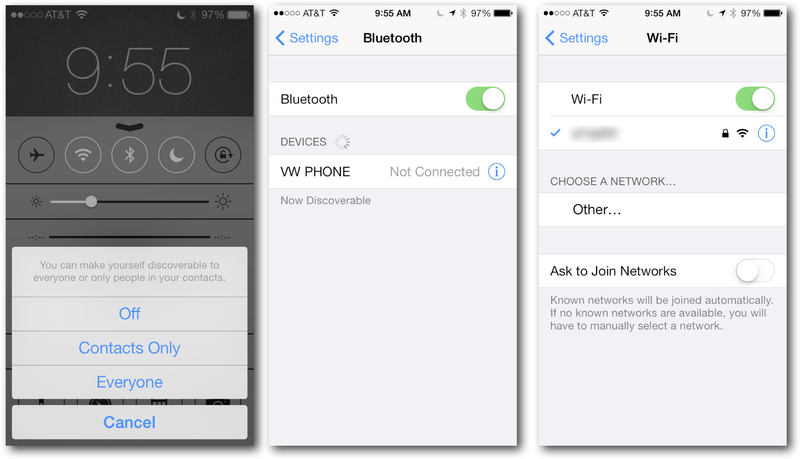 Selectively use Bluetooth and Wi-Fi: If you never connect to a Bluetooth device, then there is no reason to have it turned on. If you find that you use it with a headset, external speaker, or car, turn it on only when using those external devices. Like the brightness setting and airplane mode, this too is easily accessible by swiping up to reveal the Control Center. When you are in locations that you know does not have Wi-Fi service, you may think that there is no reason to have your device continue to look for a Wi-Fi hotspot’s services. However, depending on how often you are using your device’s location services, turning off Wi-Fi can actually have the opposite effect and decrease battery life by forcing your apps and system services to use a GPS signal to find your location. Turn off AirDrop: AirDrop is a feature where you can quickly share files, photos, map points and links with other nearby iOS devices. It has existed on OS X since Lion. Leaving it turned on will have your device look for nearby devices ever time you access the share option in your apps. Accessible on the Control Center, turning off AirDrop when you are not using it is probably best. Finding the right location services: Apple uses assisted GPS technology, which will attempt to find your location using the least amount of power possible. Even so, being selective as to which app uses location services can help conserve power as well. To control how location information is used, go to the Privacy section of the Settings app and select Location Services. You can of course turn quickly off all Location Services if you are in a hurry to conserve battery life, but that will also disable the Find my iPhone security feature. It may be better to spend some time and decide which apps and system services you want to use your location information. 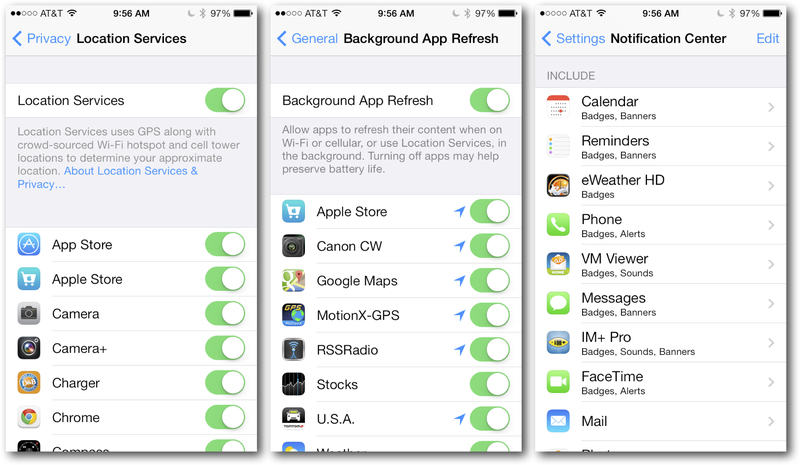 Halt background apps from refreshing: New to iOS 7 is the enhanced ability that allows apps to refresh their data in the background, sometimes referred to as multitasking. You can decide which if any apps on your device can take full advantage of this feature. Located under the General section of the Settings app, you can either switch off all of the Background App Refresh services, or you can optionally select which individual apps can refresh their data. Limit notification wakeups: Notifications wake up your device and allow apps to take action based on some external event. Having every app on your device respond to notifications can have your app powering on the lock screen to display the notification all day long. It is therefore a good idea is to be selective as to exactly which apps can be displayed on the lock screen from within the Privacy section of the Settings app. Easily accessible via the Control Center, Do Not Disturb is another great way to quickly turn off your least important notifications. Disable spotlight search: Spotlight Search will keep an updated index of all of the information you have collected on your iPhone. Maintaining this index can conserve power. Located under the General section of the Settings app, you can turn Spotlight Search off completely by not checking any of the data types listed. You can also choose exactly which types of information you do want to search for, and adjust the order that the results are displayed. Push rather than fetch email: The way in which you receive your email can cut down on your battery life as well. 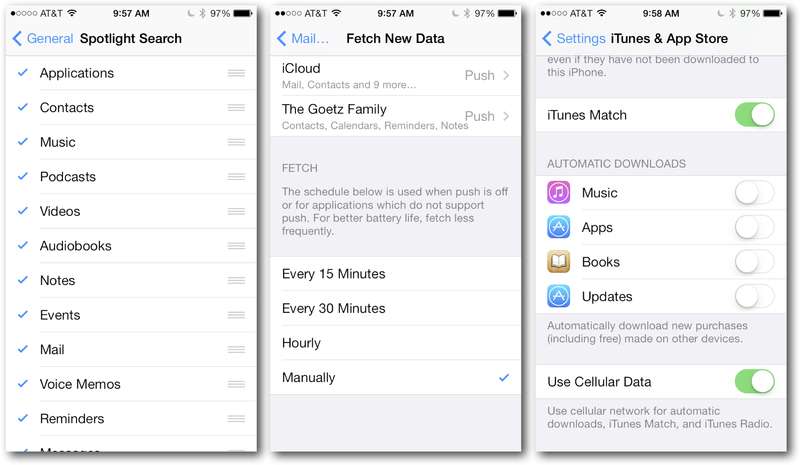 Given the fact that GMail has dropped support for pushing your mail message, switching to a fetch based service may be the cause of your battery drain. Fetching email ever five or fifteen minutes can really run your battery down in no time; manually fetch your email instead. Don’t auto download: Auto downloading content to your iPhone can be a connivence, but it also can consume battery life. You may have purchased a song on your Mac, or an app on your iPad, but that does not always mean that you wanted it on your iPhone as well. The Automatic Downloads setting is located in the iTunes & App Store section of the Settings app. Stop using Parallax and Dynamic Backgrounds – One of the new cool features is all of the advanced motion and three-dimensional effects that have been implemented in iOS 7. 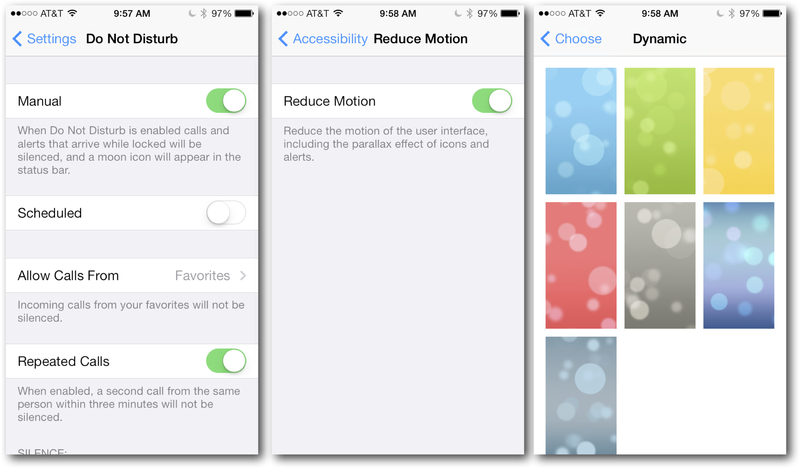 Hidden under Accessibility in the General section of the Settings app, the Reduce Motion switch will decrease the amount of motion one sees on the screen. While motion backgrounds are cool looking they really do not add to the overall functionality of the device. Go back to your standard flat wallpaper in an effort to conserve battery life. Delete some of your apps: Sure, apps are cheap and fun to try out, but having too many of them around may be part of your battery problem. With each app you install comes the opportunity for that app to use background refresh, location and notification services. Pick your favorite most useful apps and configure them to use the services that are right for you, and delete the rest. Stop running certain apps: Finding out which apps may be using the most battery life can be tricky. While an app is listed in the running list (double tap the Home button to see the list), it can still respond to notification events and wake up in the background. Selectively shutting down certain apps by flicking them off the list is also a good way to try and find out which of your apps is consuming the most battery life. 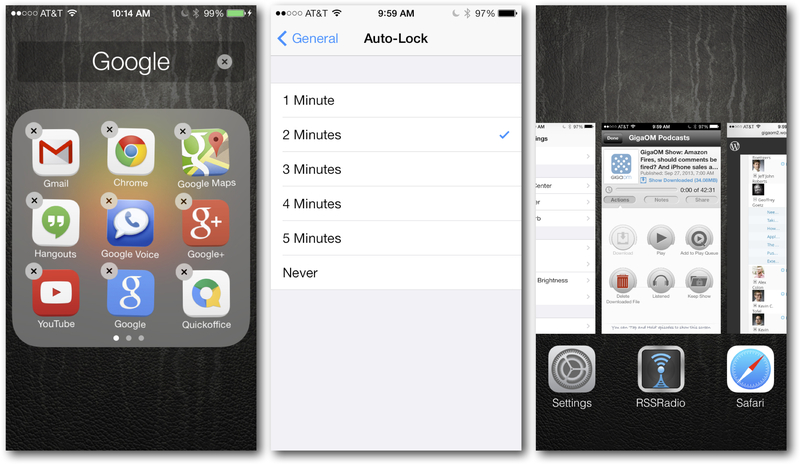 Don’t wait to auto lock: Try and get in the habit of locking your device after each time you finish looking at it. Even if you are just checking the time of day, leaving the screen on for five or even three minutes at a time can add up. Adjusting the auto lock to more quickly turn off the screen can help preserve battery life. Leaving every service up and running for all apps all of the time will certainly run your battery down. While it may sound like the best way to conserve battery life on your iPhone is to not use your iPhone, a little fine tuning and conservation can go a long way to get your battery life back up to where you like it. Found this link here on my research regarding how to solve the battery problem with my iPhone. Any opinions? Do you think this is gonna help or work? If one does not care about having wifi, 3g, push notifications, bright display, gps and etc. why does he/she buy iphone? If you want long battery life without all these stuff, go buy old nokia. One has to pay for comfort. I have only started having problems this week. My phone is on charge overnight so it’s 100% in the morning. Today, I had made one phone call of about 30 secs and 4 texts messages. In less than 6 hours of removing the phone from the charging cable, it was dead. I have just been through the info in this list and will see if it helps improve things. I love my Apple iPhone but to be left out in the middle of the bush with a phone that dies so quickly is not a good thing! what is the desired or expected battery life for iPhone 4, if i use 2g cellular data for texting and apps..and of course a few calls too….not using it continuously but yes say in every 20-30 mins ???? Battery app support iOS 7 – Extend your battery life span! Battery Plus is maintain daily battery consumption with correct charge cycles and real-time information of your deviceâ€™s battery. Really? Ever since upgrading to ios 7 on my iphone 4s the battery life has been much better. Just “updated” to ios 7 two days ago, iphone 4s battery was lasting me three days, now I don’t even get one day, have EVERYTHING shut off! Location services needs its own spot in control center to turn it off instead of going through the settings menu every time. my 4s regularly switches off despite the battery percentage being on as much as 19% at times – it will often let me switch it on again after 5-10 mins (this has just happened whilst my phone was on 12% battery) – i have not noticed this before iOS7 and my battery life is vastly reduced since the update also…………….what is going on? I like a point in above mentioned article “Uninstall apps you don’t use”. That’s it. Simple. Great tips. Thank you for covering the new battery pigs. There was a few things I did not know about. I haven’t noticed any difference in battery consumption between iOS6 and iOS7 on my iPhone 5. Though, as I recall iOS6.0 had battery issues initially that were quickly resolved with later udpates. Regarding Location Services, they are not the same for all apps. The app specifies requested location accuracy to iOS. Depending on the level, it’s possible the power hungry GPS is never even turned on, but rather location services is handled by cell tower or wifi. Example: Maps app location services require far more power than the Reminders app. Apple should concentrate on bringing more juice to their batteries rather than putting up tons of new features for us to just turn off to make room for battery life. My iphone 5 battery stinks with ios 7 I give apple one more month to fix this. I won’t even upgrade my wife’s iphone 5 until apple gets their act together. If they don’t make ios 7 more efficient, I am selling my phone and buying a galaxy s4. Is that truly standby, or does your iPhone continuously keep waking up and alerting you of new messages all the time. Apple claims that the “iPhone 5s and iPhone 5c feature up to 250 hours of standby time” and 200 hours for the 4S. I am not sure if particularly chatty and persistent notification center usage was calculated into that standby claim. I have seen some iPhones confugired that they keep displaying their lock screen messages so often that they almost never go off. The two iPhone 4 phones that I have are getting much longer standby times than 6hrs as per the numbers recorded under Settings => General => Usage. Apple does have a service where they will replace your battery. Perhaps that may be the best course of action to take in this particular instance. Especially if your battery does truly discharge faster than you can charge it. I would give AppleCare a call and see if they can recommend the best course of action for you. Why is iphone battery so rubbish? There is nothing at all wrong with the batteries that come with any of the iPhones ranging from a 1,400 mAh lithium-ion polymer battery in the origin iPhone up to a 1,570 mAh battery in the 5S. It is not uncommon to see a drop in battery life when updating to a point-zero release of iOS. One reason that so many may witness with this particular release a slightly more significant initial drop in battery life over prior releases is due to how much has changed from iOS 6 to 7. My iPhone can sit on standby for days. If I use it constantly for WiFi or watching movies, the battery drops about 10% per hour. How is this ‘rubbish’? It’s far, far better than my LG Android. Most of this is awful advice that is just going to make people worry for no good reason. Apple’s background update / multitasking system is specifically designed so that an app is only able to update while the phone’s radios are already turned on anyway (for example, when the phone is fetching mail) and it adapts to the user’s habits on a per-app basis. For example, if the user opens Instacast every morning at 7am to watch podcasts then the phone should intelligently take an opportunity to update shortly before 7am. On the other hand, apps that are never used will never be given background privileges by the system. Apple has thought this through pretty well and the last thing that is needed is clickbait FUD written by people who either don’t know or don’t care how the system actually works. I did try and be mindful of such things, and did organize the recommendations into three distinct categories, 1. Settings with the biggest impact, 2. Fine tuning your favorite features and 3. Changing your daily app behaviors. For the most part, the recommendations that are listed in section #1 are in alignment with the same battery life recommendations that come directly from Apple. As for the additional recommendations included in section #2, they are meant to help users fine tune their experience with iOS 7. There are quite a few more setting to contend with in iOS 7 compared to iOS 6. I am sorry you did not find this list useful. Been seeing these article about iPhone battery life regurgitated right and left, and they all say to turn off the same things. What no one has done, however, is actually TEST the changes and suggestions in order to see which ones (like, say, parallax) aren’t going to have any significant impact whatsoever. Or even suggestions might make sense for older phones, but not the 5s. You are correct that the observations in regard to a decrease in battery life are indeed subjective. Never the less they are apparent. I have used the Energy Performance Instrument that is available in Xcode when developing apps in the past, but I have not used such measures to diagnose individual features such as parallax. I regard to older phones, I have been using many of the afore mentioned battery saving recommendations on older iPhones for some time now. I took she I have been recommending for a while now and updated the list to include the new features of iOS 7 and those available ti the iPhone 5S. Yes, it looks like the CopyEditor was let go so stock will go up a quarter of a point. That would be correct, conserve power!!! You’ve misplaced your iPhone in your messy room, it’s late, you need because you have work tomorrow and its your alarm. The time, the effort and the power consumed for the light. Only if you had remembered where you put it in the first place, you would of simply go straight for the iPhone discarding the mess. Use a bit more energy now to remember and save even more energy looking for it later. Same concept with maintaining an index (memory), which is really useful when you have heaps of apps/info to go through and need to quickly and easily locate an app/info. The messy room is example to illustrate the point. And for the person in advance that is going to say “just have a clean room”, you can still misplace things in a clean room only difference is you’ll spend less time and effort looking for it..
It’d help if iOS 7 would let us turn off Location Services but manually specify an “I am here” location. I’m getting tired of apps wanting Location Services turned on. 99.9999% of the time, I’m in the same university town. Still worse, my WiFi, the only one visible at my location, is still cataloged as being in Seattle over 2600 miles away, so location services doesn’t even get my location right. Apple, if you’re listening, give us a way to specify a default location. With the introduction of the M7 motion processor in the new iPhone 5S, it is likely we will see developers start adding even more features that utilize motion information, not less.